Management Communication Quarterly (MCQ), peer-reviewed and published quarterly, is an essential resource for scholars of organizational and managerial practice and offers valuable and timely insights for professionals, consultants, and trainers. MCQ publishes conceptually rigorous, empirically-grounded, and practice-relevant research from across the organizational and management communication fields and has strong appeal across all disciplines concerned with organizational studies and the management sciences. Management Communication Quarterly is an essential resource for scholars of organizational and managerial practice and offers valuable and timely insights for professionals, consultants, and trainers. MCQ publishes conceptually rigorous, empirically-grounded, and/or practice-relevant research from across the organizational and management communication fields and has strong appeal across all disciplines concerned with organizational studies and the management sciences. A unique and valuable peer-reviewed journal, Management Communication Quarterly articles cover all aspects of communication in management and organizational contexts. Our authors cross the disciplinary boundaries of academic management study and explore a variety of contemporary organizational problems by conceptualizing or applying cutting edge theories and methodologies. Management Communication Quarterly exposes its readers to the best thinking from a global network of organizational scholars. MCQ’s Editorial Board spans every continent and provides expertise for reviewing scholarship relating to the broad realm of management, communication, and organizational studies. Each issue of Management Communication Quarterly features a range of original studies. There is a regular Forum section devoted to provocative essays and commentaries on evolving issues in the field. The journal also publishes research notes on emerging areas of inquiry, empirical explorations and reviews of current books and texts. Management Communication Quarterly presents conceptually rigorous, empirically-grounded, and practice-relevant research from across the organizational and management communication fields and has strong appeal across all disciplines concerned with organizational studies and the management sciences. Authors are encouraged to submit original theoretical and empirical manuscripts from a wide variety of methodological perspectives covering such areas as management, communication, organizational studies, organizational behavior and HRM, organizational theory and strategy, critical management studies, leadership, information systems, knowledge and innovation, globalization and international management, corporate communication, and cultural and intercultural studies. Criteria for publication include originality, provocative character, conceptual significance, methodological rigor, and relevance to scholars of communication in management and organizational contexts. MCQ also occasionally publishes manuscripts that introduce innovative research methods to the organizational and management communication fields. Such manuscripts must articulate details of the method and provide empirical evidence of the method’s efficacy for organizational and management communication research. Research method articles are shorter than regular articles, running approximately 4,000-5,000 words total. In addition, MCQ features a regular Forum section that includes themed essays, commentaries, debates, conference discussions, and book reviews. Manuscripts should be submitted electronically to http://mc.manuscriptcentral.com/mcq. Authors will need to set up an online account on the Sage’s Manuscript Central system powered by ScholarOne, if you do not have an account. Manuscripts will be sent out anonymously for editorial evaluation. Submission of a manuscript implies commitment to publish in the journal. Obtaining permission for any quoted or reprinted material that requires permission is the responsibility of the author. Authors submitting manuscripts to the journal should not be simultaneously submitting them to another journal, nor should manuscripts have been published elsewhere in substantially similar form or with substantially similar content. Authors in doubt about what constitutes prior publication should consult the Editor. the body of the manuscript and the reference list. When necessary, use endnotes instead of footnotes and keep tables and figures in separate files instead of in text. Use no more than 8 keywords. The DOI of a reference, if available, can be searched at http://www.crossref.org/guestquery/. Manuscripts submitted in a different style or not meeting submission stipulations will not go to review and be unsubmitted. Author(s) should consult with the editor about Forum proposals and procedures. All manuscripts must be submitted in a current Word format and be double spaced throughout with only left justification. Manuscripts reporting a study are to provide sufficient detail about the method, so to allow for possible replication and aid reader interpretation. Published methods should be referenced. It is helpful to have a data analysis subsection in which you outline what you will do to test hypotheses and/or find answers to research questions, and what result will be considered to be supportive or informative. The editors and editorial board make every effort to review manuscripts thoroughly and promptly. The editor initially determines whether the content of the manuscript is appropriate for the journal and whether there is sufficient publication potential to proceed with anonymous reviews. Manuscripts that do not pass this initial screening are returned immediately. Manuscripts about research with students as subjects/respondents will generally be considered when such student participation is directly relevant the topic of the study, e.g., students as targets of recruitment. A manuscript sent out for the review process is typically completed in eight to ten weeks. For editorial policies or questions regarding the journal, feel free to contact the editor, Dr. Patty Sias, at psias@email.arizona.edu. 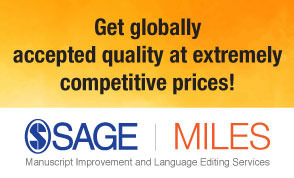 For more information, please refer to the SAGE Manuscript Submission Guidelines.